Another motor yacht joins the Sunseeker Germany sales fleet as Oliver Sieckmann sends news that he's signed the 28.14m Maisenhausen for sale. 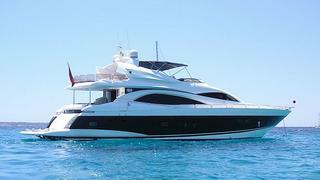 A Sunseeker 84 built in 2004, she features a gloss cherrywood interior accommodating eight guests in four staterooms plus three crew and twin 1800hp MTU engines power her to a maximum speed of 32 knots. Lying in Mallorca, Maisenhausen is asking €1.97 million, VAT paid.